Welcome home to this move-in condition home in Knollwood&apos;s Fox Chase in Northpoint, Discovery, Penn Schools! This is your opportunity for a truly turn-key property inside and out. Built in 2002, it is one of the newer homes in the neighborhood, and also one of the largest lots in the subdivision with just under one acre. From the moment you enter the home from the wide front porch, the natural light is evident throughout. The two-story foyer, 9-ft. ceilings and open floor plan make for a bright spacious feel. The remodeled kitchen offers quality white soft-close cabinets and drawers, granite countertops, farmhouse sink, and a pantry outfitted with pull-out drawers. Since 2017, numerous quality updates have been completed: Brand new quality wood flooring was just installed on the main level! New high-efficiency furnace with air purifier, air conditioner, gas range, convection oven, washer, dryer, water heater, sump pump, carpet on two levels, gutter guards, and air duct cleaning. The 3-car garage walls and ceiling are completely finished. 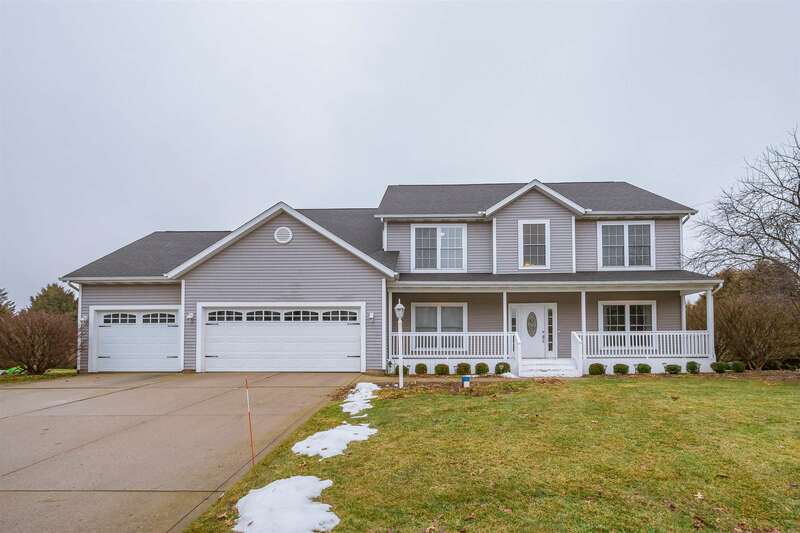 What a value for this size in the school district, amount of updates, and finished lower level complete with a half bathroom!